Our resident floral designer and Cash and Carry manager, Olga Ramirez, AIFD, CFD, recently presented a lovely collection of bridal bouquets for a bridal show in Miami. Each of the bouquets in this showcase feature only fresh-cut flowers from Jet Fresh Flower Distributors. Here she uses popular flowers in colors that are often sought-after for weddings and events year-round. In this episode of JFTV en Español (subtitles available in English), Olga goes over 8 different bouquet samples which she created in various sizes and styles for both brides and bridesmaids. 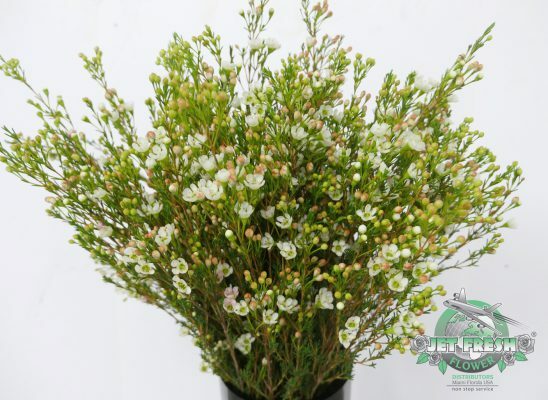 From classic white with greenery, to popular peaches and proteas, the floral design ideas for weddings are endless when you’re using flowers from Jet Fresh Flower Distributors. Olga Ramirez, AIFD, CFD designed coordinating bride and bridesmaid bouquets for this bridal collection in a beautiful marsala garden theme. These flowers are arranged quite uniquely for bridal bouquets, and are the perfect wedding inspiration for summer and fall, as well as destination and tropical events. This bridal bouquet is a loose arrangement with a luscious assortment of fresh-cut flowers from Jet Fresh Flower Distributors. The bouquet contains several focal flowers including Mayra’s Red Garden Roses, peach “Sahara” Sensation Spray Roses and White Anemones. The details in this bouquet are very impressive though, containing a great range of textured fillers such as pink Scabiosa, pink Astilbe, white Blushing Bride Protea, red Hanging Amaranthus, Chocolate Queen Anne’s Lace, Seeded Eucalyptus and Silver Dollar Eucalyptus. The coordinating bridesmaid bouquet which Olga designed has similar elements that complement the bride bouquet very well while still standing out on its own. She created a half-cascading bouquet using only red Hanging Amaranthus instead of additional greenery. 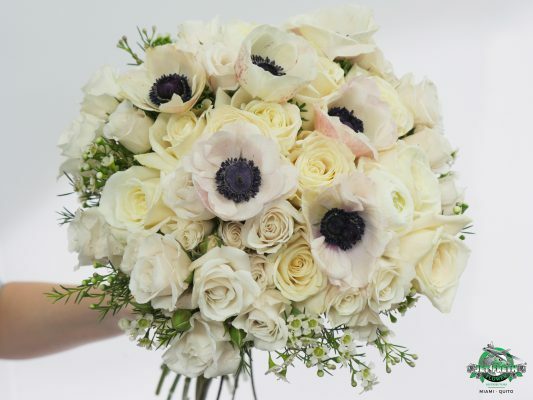 The bouquet also has Mayra’s Red Garden Roses, peach “Sahara” Sensation Spray Roses and pink Scabiosa and Chocolate Queen Anne’s Lace; along with white Lisianthus and green “Sirius Questar” Eryngium. Peach has become an increasingly popular wedding color for its ability to coordinate well with white, cream, pink flowers as well as greenery. 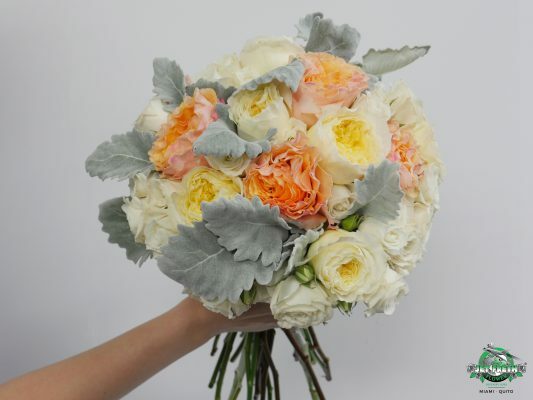 In this collection, Olga designed a high-end peach bridal bouquet along with coordinating bridesmaid bouquets. The loose bridal bouquet has an incredible assortment of fresh-cut flowers from Jet Fresh Flower Distributors. This bridal bouquet contains “Mayra’s Peach” Garden Roses, peach “Sahara” Sensation Spray Roses, “Playa Blanca” Roses, Blushing Bride Protea, white Lisanthus, pink Astilbe, white Wax Flower, Seeded Eucalyptus and Dusty Miller. “Mayra’s Peach” Garden Roses are the focal flowers in these beautiful peach bouquets. 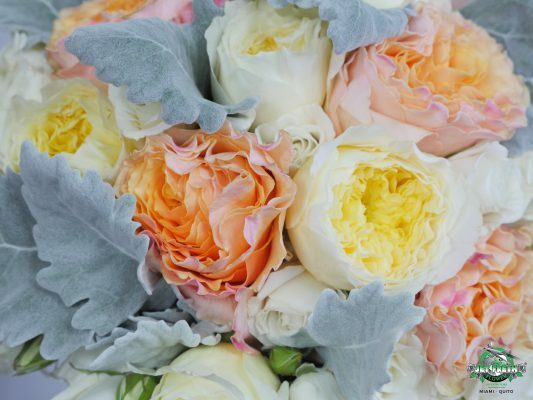 As the garden roses continue to bloom, these ruffled petals reveal their true peach center. Blushing Bride Protea is another gorgeous wedding flower in this bouquet. Technically a protea, Blushing Bride adds an elegant, whimsical touch that softens bridal bouquets with its soft petals and subtle hints of blush. The coordinating peach bridesmaids bouquets in this collection have very similar ingredients compared to the peach bride bouquet; although, they are both different, respectively. 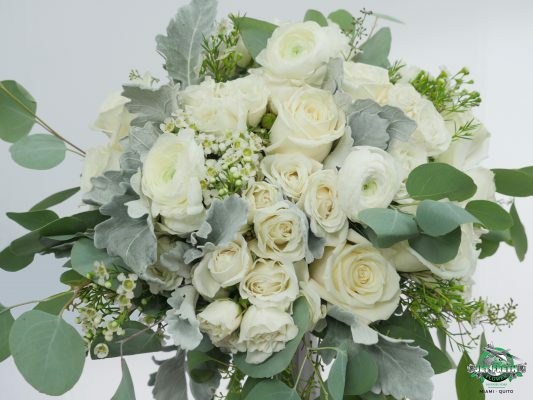 One bouquet clearly has Silver Dollar Eucalyptus; whereas, the other bridesmaid bouquet contains Dusty Miller. Both of these bouquets also contain David Austin “Patience” Garden Roses for an extra hint of cream which pairs nicely with the ruffled “Mayra’s Peach” garden roses for an elegant bouquet. The classic white bridal bouquet is a look that will stand the test of time. It’s the perfect complement for white and ivory bridal gowns, and the flower combinations are positively endless. In this collection, Olga also designed 3 different white bridal bouquets using various types of fresh-cut flowers from Jet Fresh Flower Distributors. This loose bridal bouquet has a beautiful balance of fresh white flowers and greenery perfect for any garden or rustic-themed wedding. 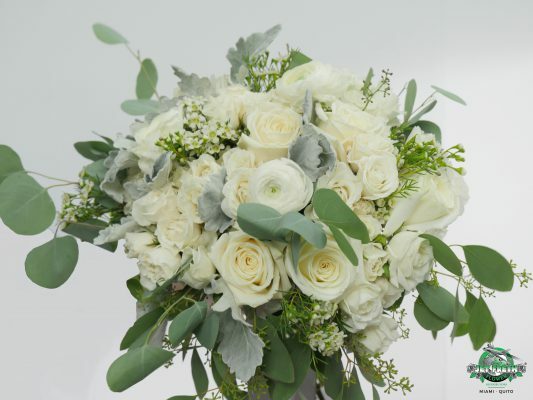 The arrangement features an elegant mix of soft greens with Seeded Eucalyptus, Silver Dollar Eucalyptus and the silvery Dusty Miller. 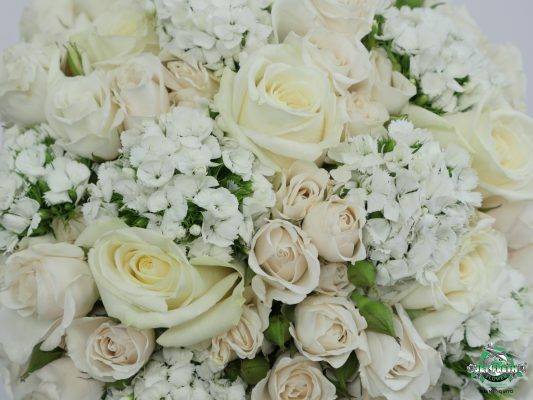 However, the assortment of white flowers really keeps its garden essence with white Ranunculus, white Majolica Spray Roses, white Wax flower and “Playa Blanca” Roses. The second classic bridal bouquet Olga has designed in classic white for this collection is a classic posy-style bouquet. This arrangement has a more traditional shape that’s elegant and easy to hold. 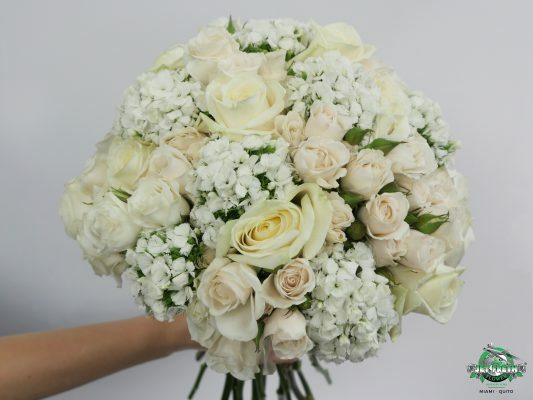 The various shades of white in this bouquet give the arrangement more depth, which creates the illusion that there are many different types of flowers. 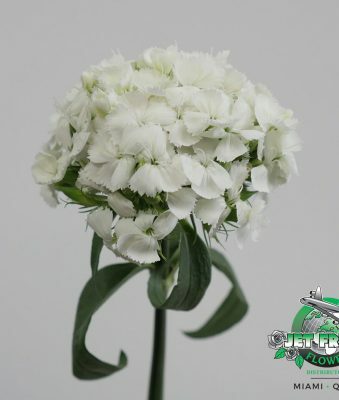 In fact, there are only three different varieties of flowers in this bouquet: “Playa Blanca” Roses, white “Majolica” Spray Roses and white “Leeds” Barbatus Dianthus. The final classic white bridal bouquet which Olga has created for this showcase is a larger bouquet with similar ingredients from both arrangements. 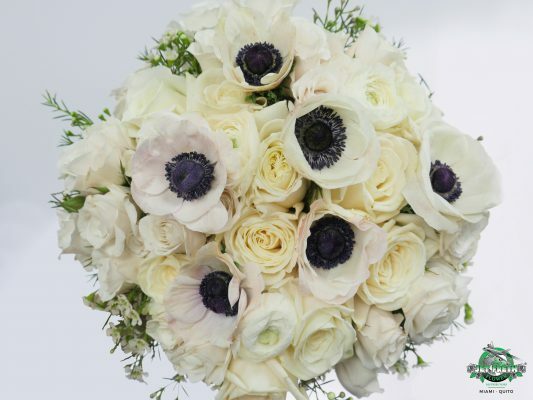 The biggest standout in this white bridal bouquet are the anemones. This playful flower is a wedding favorite for its rustic charm which coordinates beautifully with white Ranunculus, white Wax Flower, white “Majolica” Spray Roses and “Playa Blanca” Roses. All of these fresh-cut flowers and more are available to order from Jet Fresh Flower Distributors. For local sales and availability please contact (305) 499-9144, or visit our Miami Cash & Carry flower market for fresh-cut and preserved flowers by the bunch and box. 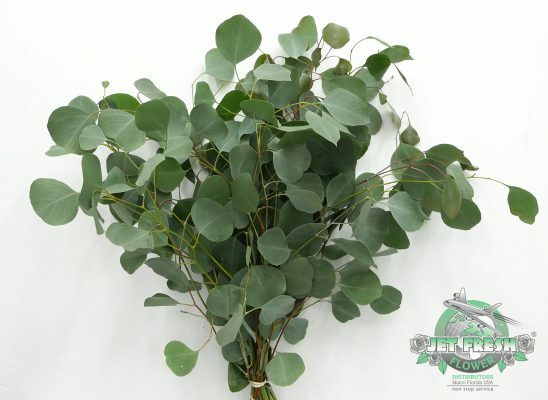 For all domestic U.S. sales, please contact Sales@JetFreshFlowers.com. 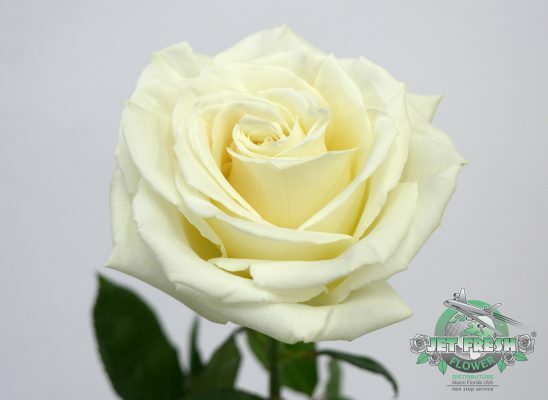 For international, global trading and farm-direct sales, please contact SalesGlobal1@JetFreshFlowers.com. This entry was posted in #FreshInspiration, News. Bookmark the permalink.